Highway blowouts and Fix-A-Flat could soon be things of the past. Following the trend started by Michelin with the Tweel, Bridgestone recently unveiled an airless tire of its own at the Tokyo Motor Show. 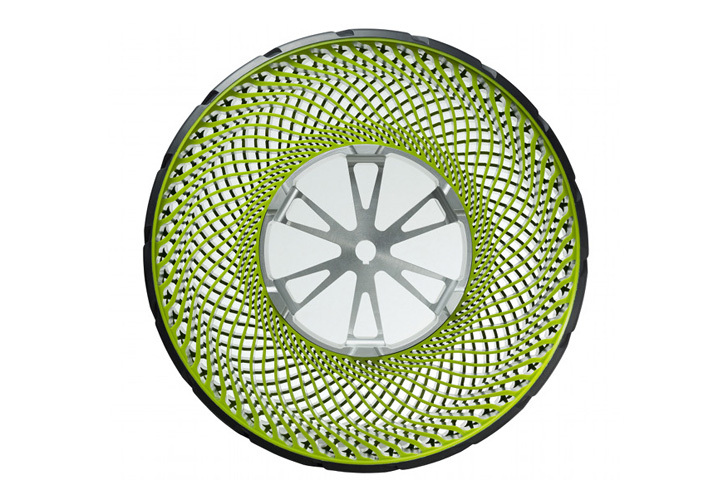 Bridgestone’s air-free concept is supported by a mesh of spokes that are made of thermoplastic resin. The material is flexible and durable, and best of all, it’s 100-percent recyclable! Because air-free tires eliminate the risk of punctures, they’re both safer and less wasteful than conventional pneumatic tires. And Bridgestone says that the thermoplastic resin can be recycled back into new tires, eliminating waste from the equation altogether. The airless design would also eliminate the need to carry a spare tire, removing unnecessary weight from cars and freeing up storage space. The airless tire concept that Bridgestone rolled out at the Tokyo Motor Show is nine inches in diameter, and each wheel is strong enough to support about 150kg, according to the company. One potential problem lies in the spoke design, which will need to be protected in order to keep objects from getting lodged in the spokes. So far, the company has been testing the airless concept on a small one-seat electric vehicle, and it plans to continue developing the technology for wider commercial use. When will they be available for purchase in the US? So it is made from plastic which is a by-product of the oil&gas industry? So there are new applications for waste from the O&G industry and this one claims to be recyclable....how much energy is used to create the by-product and the main product? Are we having the wool pulled over our eyes here? i totally agree with wink614. there should be a study as to how safe this tires would be on the road as any foreign object, stone, metal etc. could get trapped inside those holes. these trapped objects could slingshot to oncoming traffic or innocent bystanders at very high speeds. i agree with wink614, we have to determine how safe it would be on the road as any small object, stone, metal etc., could get trapped inside those holes and the tire could slingshot it to oncoming traffic or innocent bystanders at ~60mph or faster. Great idea but I do have one question. Will there be something to cover the sides so rocks, sticks, etc. do not get stuck in the framework of the tire? I can't imagine that it would function properly if it were unable to flex completely. 150kg x 4 = 600kg. Sounds a bit lightweight to me. Also, how does the weight of each wheel compare to the traditional wheel+tyre combo? Highway blowouts and Fix-A-Flat could soon be things of the past. Following the trend started by Michelin with the Tweel, Bridgestone recently unveiled an airless tire of its own at the Tokyo Motor Show. Bridgestone's air-free concept is supported by a mesh of spokes that are made of thermoplastic resin. The material is flexible and durable, and best of all, it's 100-percent recyclable!